Just print this cute little snowman template out. Have the kids use crayons or makers to color it. Add some glitter to his hat and scarf if you want. Then grab some colored construction paper. You can use blue construction paper, so it will look like a winter background. Have the kids cut the snowman out along with his hat, scarf, arms and two buttons. Tape or glue down on the blue construction paper. Then have them grab a white crayon and color snow all over the ground. Then add snowflakes falling all over the page. Punch a hole in the top of the construction paper and let them run some yarn through so they can hang it up at home somewhere. Or you can even take these and staple them all over a bulletin board in your Children's Church or Sunday school room. Spell out the words, "He will Wash You White As Snow" in black letters on your bulletin board. You could also make this into a Christmas Card for the kids to make and give to their parents. 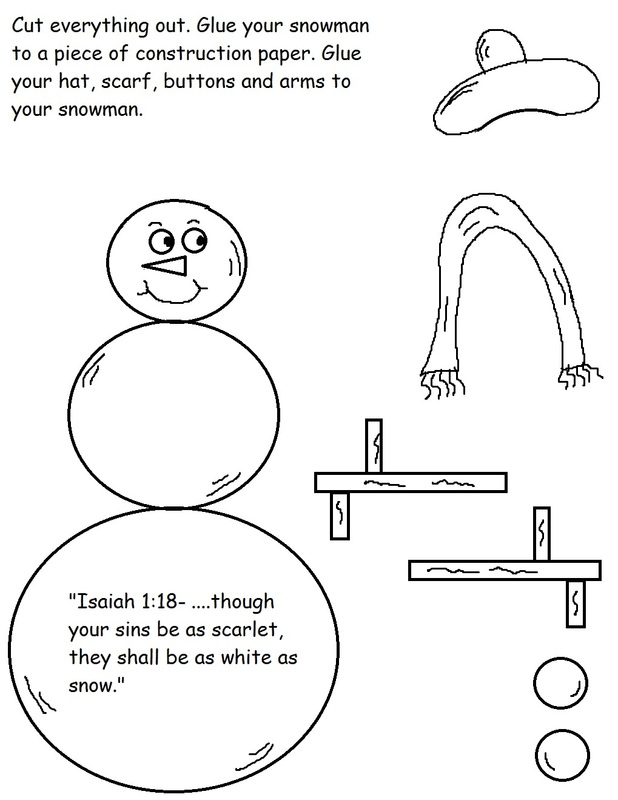 Just have them make the snowman the same way as described above except take two more extra pieces of construction paper and lay the snowman sheet inside of them. Staple on left side at top, bottom and middle to make a large card to open up. Have the kids write who it's to and from on the front of the card. Let them draw a pretty winter Scene on the front. Use this easy craft to go along with our Snowman "Isaiah 1:18" Lesson we have.